One method, two dips! 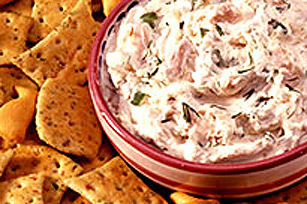 Just follow our simple steps and you'll have a party-pleasing appetizer dip in minutes (the hardest part will be deciding on tuna or salmon!). COMBINE all ingredients except crackers and mix well. SERVE as a dip with VEGETABLE THINS Crackers.